A. retusus LRM326, Paso de Carneros habitat. A. retusus LRM326, at the type locality for A. furfuraceus. 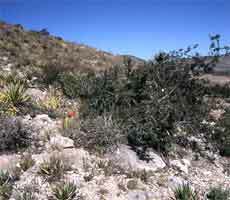 This is the type locality for Ariocarpus furfuraceus, contrary to previous reports on the size of this population it appeared to be very limited in size and we were able to find only one living specimen. This plant also appeared very stressed and it may be that climatic changes have had a severe effect on this population. 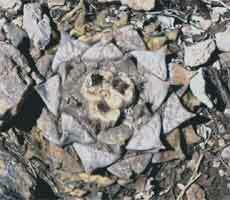 The plant has broad triangular wrinkled tubercles and grows on the south west facing slopes of limestone hills.